Haluski, or Halusky, is a great, easy dish that was brought to our family by my great-grandmother, and passed down to my grandmother, who used to make it for me. It is a common dish in countries such as Slovakia, Czech Republic, Poland, Serbia, Ukraine, Romania and Hungary. It is very easy to cook, and there are lots of variations to it. We always made it this way, but some people will add fried hamburger to it, or sour cream. Once you get the basics down, you can do anything you want to with it. First, chop the cabbage. You can make the strips long, or cut them again. However you prefer. Put this in a large pot and start boiling it. I usually salt the water at this point also. Probably about 1 tablespoon to start with. 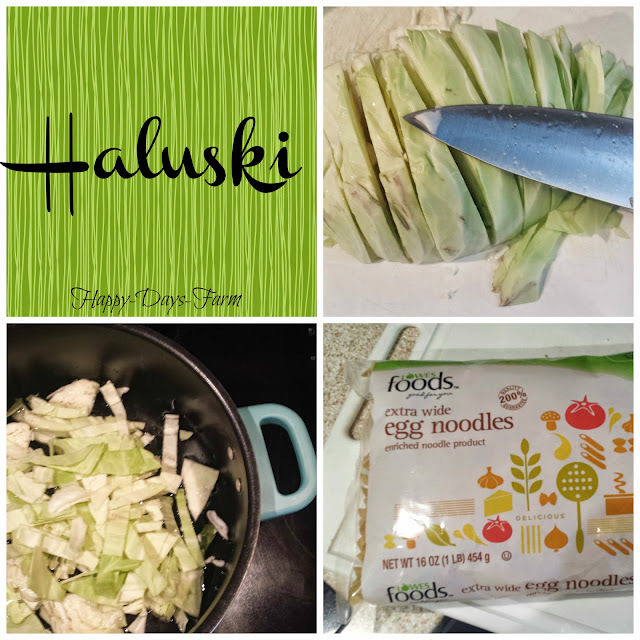 At the same time, pour the bag of egg noodles on top of the cabbage. Put the lid on, and they will cook at the same time as the cabbage. Just keep an eye on them. Cook times will vary based on how big a cabbage head you used. I generally start stirring it in about 10 minutes or so. 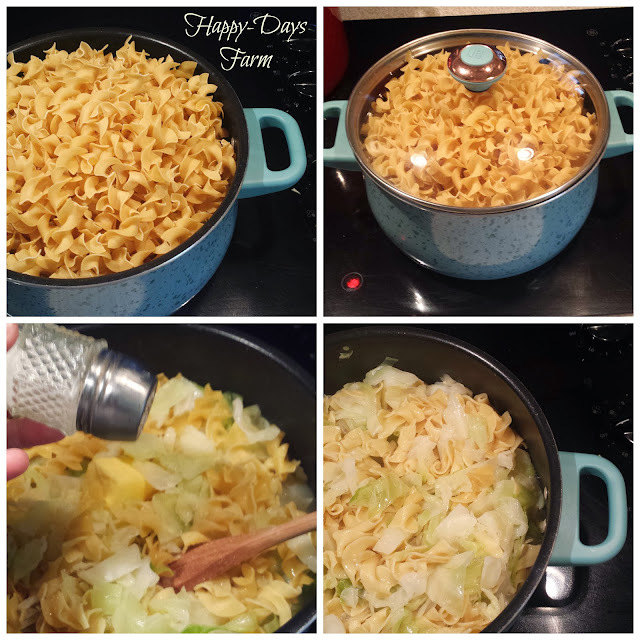 When the noodles have become soft, I add the stick of butter, and another tablespoon of salt. Remember this is an entire head of cabbage and bag of noodles. That is not a lot of butter for all that cabbage, and you will need to keep salting it till you get it to taste right. At this point, you are almost finished. You just keep stirring it and cooking the water out. You will not be pouring the water off of it, you will cook it out, but you have to watch now or it will stick to the bottom of your pan. My grandmother would cook it all the way down, and she would say, fry the noodles just a bit on the bottom. I would cook this with caution. It is a plain dish, but you may get addicted. Once you get it salty enough you will love it! If you want a little history on the dish, wikipedia has a neat description, here.